I’m meant to travel slowly. That’s the whole point of having all the time in the world. So completely disrespecting this I decided to head from Croatia to Montenegro for my second new country in four days. Almost as soon as you cross the border, you can see there is a difference in wealth between the two countries. 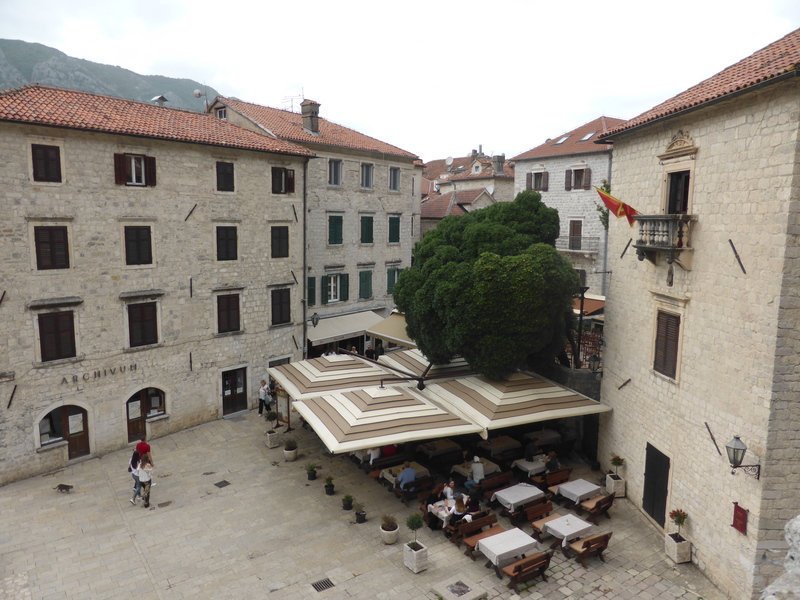 After the splendour of Dubrovnik, Montenegro is just a little bit plainer and a little bit less shiny. I found it very pretty though. Tiny seaside villages and the beautiful contrast of water and mountains. The mountains from which Montenegro takes its name mean that, as you reach the Bay of Kotor, the water of the Adriatic looks much darker than it does off the coast of Croatia. I am a very independent traveler but after checking out the public transport options between Dubrovnik and Kotor, I decided that a guided tour was by far the simplest way to see what I wanted to see in Montenegro so I bit the bullet and booked with a local company, Atlas. And it was a good choice. They got the balance between guided and tour just right for me. 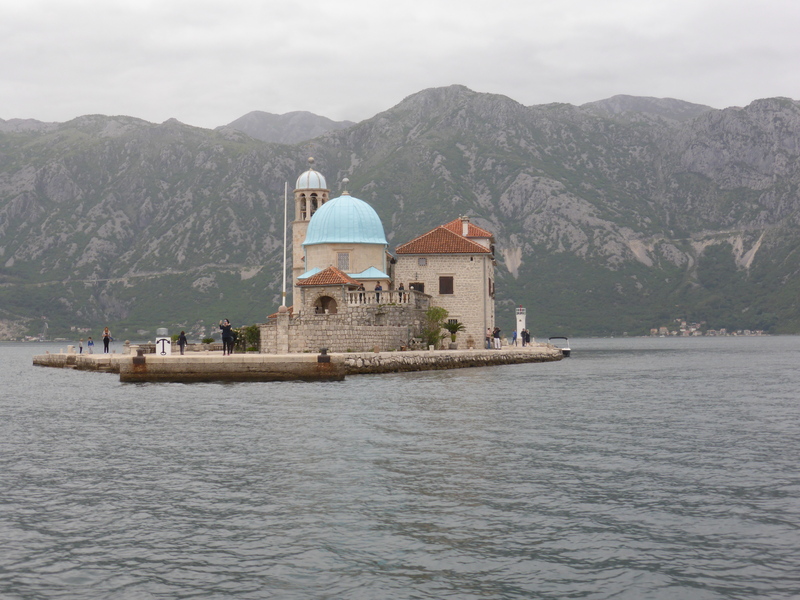 The first stop was the small town of Perast where we caught a boat (always a plus for me) to the island of Gospa od Škrpjela (Our Lady of the Rocks). The island is completely man-made. As the story goes, an image of the Madonna was found on a rock and it was taken as a sign that a church should be built there in her honor. Over time sailors, grateful at returning home safely, dropped rocks in the water and even sank pirate ships to create the island on which they built the church. Each year the local people sail over to the island on July 22 and add more rocks to continue the task. The church itself is small but attractive with many objects of beaten silver left as a tribute for the Madonna after prayers. There is also a museum which contains artworks, as well as other tributes left in the church, ranging from random household objects to muskets, keys and even a typewriter. The guide gave us time to explore the island ourselves (it’s not that big although with the locals adding to it each year it may be bigger if I go back in a few years) and then it was back on the boat to the mainland. 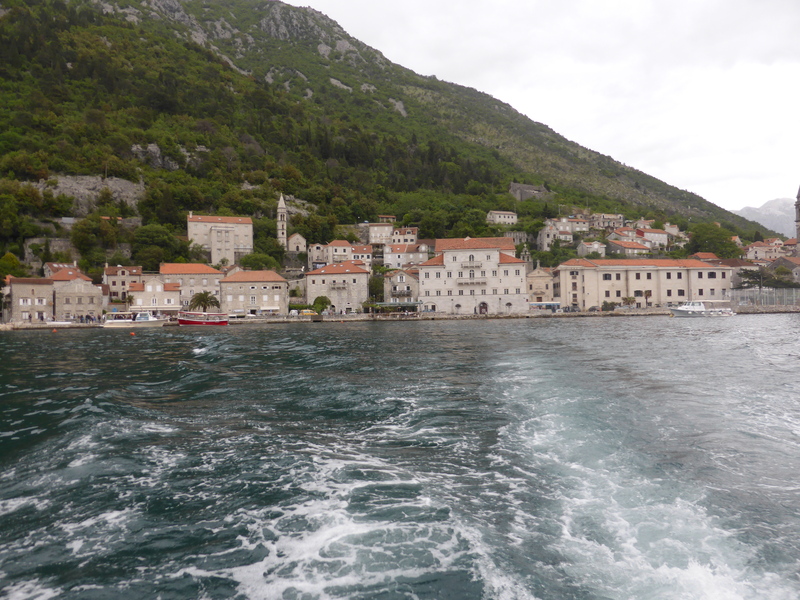 The coach continued round the coast of the Bay of Kotor until we reached the town of Kotor itself. A historic walled town where for once I chose not to walk the city walls as they headed half way up a mountain (1350 steps to reach a fort situated at 260m above sea level) and I didn’t have all day. We were met at the main gate to the town by the local guide who proceeded to take us on a tour of the main squares, pointing out the principal historic buildings and telling us some of the history of the place. It was a fascinating tour and it was nice to hear from someone so proud of their hometown. 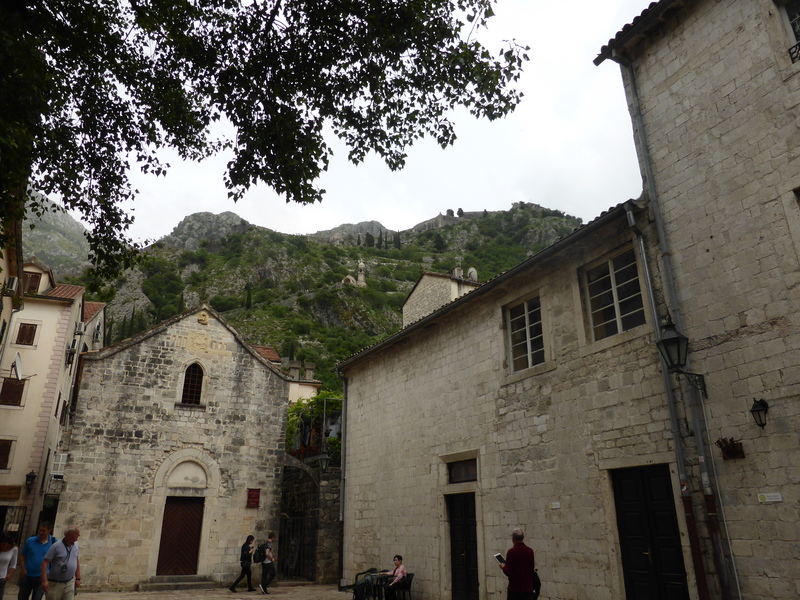 After the guided tour, we had a couple of hours free to explore Kotor on our own. The guide offered to take the group off to lunch in a restaurant she recommended but Little Miss Independent here decided to go off on her own and have a rather mediocre lunch in a pretty little square. When I met up with the group later, they said the restaurant recommended by the guide was excellent so I think there is a lesson or two in there for me, something about trusting people and being a bit more sociable, maybe. After lunch I wandered backwards and forwards and round and round through the many alleyways of Kotor. It was very different in style to Dubrovnik Old Town but no less pretty. 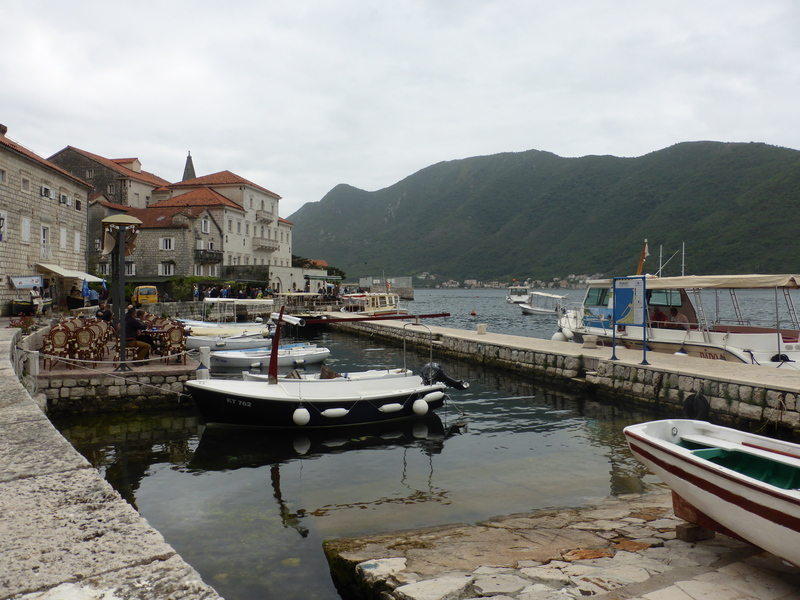 Like Dubrovnik, Kotor is a destination for cruise ships and on the day of our visit, there was one moored right outside the city walls almost dwarfing the town itself with its size. But apparently Kotor can absorb one ship of people better than Dubrovnik can absorb four and the crowds were not too bad. I think generally along this coast though it is worth knowing what days the cruise ships are in town so that you can run screaming in the opposite direction. So that’s my trip to the Bay of Kotor in a nutshell. A lovely day out and maybe Montenegro should be added to my list of places to go back to (a list that is almost equal in length to the list of places I want to visit, maybe I should start looking into reincarnation…). Based on my experiences, I can really recommend Dubrovnik as a place to base yourself in order to explore the region, although it is also probably is the most expensive place in the region to stay.